Independent lubricant manufacturers usually do not have their own refineries. They purchase base oils from major oil suppliers. Manufacturers then blend these oils with additives to make lubricants for industrial manufacturing customers and automobile makers. Independent lubricant manufacturers primarily focus on manufacturing and marketing lubricants for specialties and niche businesses. Independent lubricant manufacturers offer services to end-user industries such as automotive, aerospace, marine, and industrial. The lubricants required in these end-user industries chiefly comprise of engine oils, gear oils, hydraulics fluids, transmission fluids, greases, heat transfer fluids, coolants, and cleaners. Lubricants are also required in industries such as personal care, agriculture, and railway. According to the report, the global independent lubricant manufacturers market was valued at US$6,800.79 mn in 2016 and is estimated to reach US$9,454.04 mn by 2025, expanding at a CAGR of 3.80% between 2017 and 2025. In terms of the end users served by independent lubricant manufacturers, the report examines the growth prospects of the independent lubricant manufacturers market across the automotive, aerospace, marine, and industrial sectors. Of these, the automotive sector is presently the leading contributor of revenue to the global market. The segment accounted for a massive 67.4% of the global market in 2016 and is expected to remain the key consumer of lubricants manufactured by independent manufacturers. Rise in demand for automotive is anticipated to drive the demand for automotive lubricants in the next few years as well. Increase in environmental awareness and implementation of strict government regulations are expected to boost the demand for high-quality and greener lubricants in the automotive industry in the next few years. As the global appetite for automobiles continues to rise, led by the growth in disposable income of consumers, the demand for products from independent lubricant manufacturers is also expected to rise significantly in the next few years. In terms of geography, Asia Pacific is expected to observe a growth in its share during the forecast period, while there is expected to be a decline in the shares for the rest of the regions. Expansion in the independent lubricant manufacturers market in Asia Pacific is primarily ascribed to the expansion of emerging economies and the ever-developing automotive industry in the region. Asia Pacific shows strong potential for the independent lubricant manufacturers market in the forecast period due to the availability of raw materials to produce lubricants, low-cost of labor, and the number of major players that provide base oils as well as additives to the regional independent lubricant manufacturers. The demand for lubricants in Europe is primarily led by countries such as Germany, France, U.K., and Russia. The market in Western Europe is comparatively mature than Eastern Europe, but the latter is anticipated to show comparatively higher promise in terms of growth potential for the independent lubricant manufacturers market. North America and Europe are considered mature markets due to the presence of well-established key players and developed economies in these regions, which enables independent lubricant manufacturers in these regions to establish their presence in their respective local markets. The U.S. market accounts for the dominant share of the independent lubricant manufacturers market in North America. The well-established civil aviation industry, coupled with defense sector in the region, is primarily viewed as a key driver for the overall demand for lubricants manufactured by independent lubricants manufacturers. Some of the leading companies operating in the global independent lubricant manufacturers market are FUCHS, ADDINOL Lube Oil GmbH, AMSOIL INC., BVA Oil, Carlube, Forsythe Lubrication, and Motul. Independent lubricant manufacturers usually purchase base oils from major oil suppliers since they do not have their own refineries. In order to provide lubricants for various end-user industries such as industrial and automotive, manufacturers blend these oils with additives to make lubricants. Independent lubricant manufacturers primarily focus on manufacturing and marketing lubricants for specialties and niche businesses. They offer their services to end-user industries such as automotive, aerospace, marine, and industrial. Mineral lubricants are those whose formulations include mineral base oil and additives. These lubricants include those that are produced from group I and II base oils. Synthetic lubricants are those whose formulations include synthetic base oil and additives. They are artificially made chemical compounds, using chemically modified petroleum components rather than whole crude oil. Group II+, III and some of group IV base oils falls under the class of synthetic base oils. Bio-based oils include oils derived from vegetable oils and animal fats. They are manufactured from either natural or synthetic sources. The major application boosting the demand for lubricants is automotive sector. Rise in demand for automotive is anticipated to drive the demand for automotive lubricants in the next few years. Increase in environmental pressure and implementation of strict government regulations are boosting the demand for high quality lubricants in automotive and industrial end-use industries. The report estimates and forecasts the independent lubricant manufacturers market on the global and regional levels. The study provides forecast between 2017 and 2025 based on volume (kilo tons) and revenue (US$ Mn) with 2015 as the base year. The report comprises an exhaustive value chain analysis for each of the segments. It provides a comprehensive view of the market. Value chain analysis also offers detailed information about value addition at each stage. The study includes drivers and restraints for the independent lubricant manufacturers market along with their impact on demand during the forecast period. The study also provides key market indicators affecting the growth of the market. The report analyzes opportunities in the independent lubricant manufacturers market on the global and regional level. Drivers, restraints, and opportunities mentioned in the report are justified through quantitative and qualitative data. These have been verified through primary and secondary resources. Furthermore, the report analyzes substitute analysis of independent lubricant manufacturers and global average price trend analysis. The report includes Porter’s Five Forces Model to determine the degree of competition in the independent lubricant manufacturers market. The report comprises a qualitative write-up on market attractiveness analysis, wherein end-users and regions have been analyzed based on attractiveness for each region. Growth rate, market size, raw material availability, profit margin, impact strength, technology, competition, and other factors (such as environmental and legal) have been evaluated in order to derive the general attractiveness of the market. The report comprises price trend analysis for independent lubricant manufacturers market between 2017 and 2025. 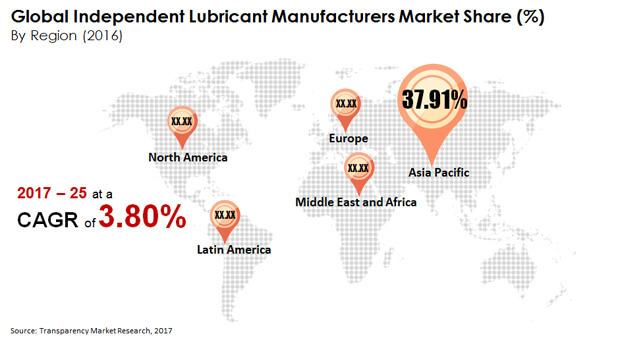 The study provides a comprehensive view of the independent lubricant manufacturers market by dividing it into product, end-user, and geography segments. The products have been segmented into mineral lubricants, synthetic lubricants, and bio-based lubricants. The end-users are segmented into automotive, aerospace, marine, industrial and others. These segments have been analyzed based on historic, present, and future trends. Regional segmentation includes the current and forecast consumption of independent lubricant manufacturers in North America, Latin America, Europe, Asia Pacific, and Middle East & Africa (MEA). Market segmentation includes demand for consumption in all the regions individually. The report covers detailed competitive outlook that includes market share and profiles of key players operating in the global market. Key players profiled in the report include ADDINOL Lube Oil GmbH, AMSOIL INC., BVA Oil, Carlube, Forsythe Lubrication, and Motul. Company profiles include attributes such as company overview, number of employees, brand overview, key competitors, business overview, business strategies, recent/key developments, acquisitions, and financial overview (wherever applicable). Secondary research sources that were typically referred to include, but were not limited to, OPEC Annual Statistical Bulletin, U.S. Energy Information Administration (EIA), Independent Chemical Information Service (ICIS), Independent Lubricant Manufacturers Association (ILMA), The Union of the European Lubricants’ Industry (UEIL), The UK Lubricants Association (UKLA), SAE International, company websites, financial reports, annual reports, investor presentations, broker reports, and SEC filings. Other sources such as internal and external proprietary databases, statistical databases and market reports, news articles, national government documents, and webcasts specific to companies operating in the market have also been referred for the report.